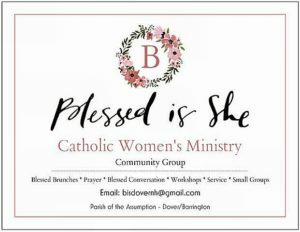 A Catholic Women’s Community Group which resulted from a desire to create a safe, welcoming environment where women can gather, renew their faith and inspire their spirit. In this very busy world where women are pulled in many different directions, it can be challenging to find the time, space and support to strengthen our spirituality. 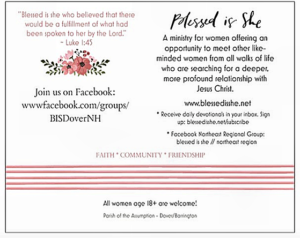 Blessed Is She presents women with an opportunity to meet other like-minded women from all walks of life who are searching for a deeper, more profound relationship with God. The Ministry is a national ministry, and the Parish of the Assumption is fostering its own chapter. Gatherings will occur once a month at the Chapel of the Nativity in Barrington (or other specified locations) and is open to any woman over the age of 18. Each Chapter of Blessed Is She develops its own character and dynamic based on its membership and we look forward to seeing where God will guide us. Thank you for praying for us as we seek a stronger relationship with Christ while simultaneously supporting one another as women of faith. You can learn more about this new ministry in the bulletin or online.